Considering how large the card pool for Filth Casserole is (especially considering that I’m the only person I know of who still discusses it publicly on the internet and I’ve tended to dip into Legacy and Commander cards), it’s not every day that a new release single-handedly pushes a new deck. The same applies, and even more broadly, to Commander, where Kaalia of the Vast gets a hard-to-stop alternate win whose only opportunity cost is going a little heavier on the demon component of her deck. We’ve come a long way since demon cards had truly debilitating drawbacks, and creatures like Master of the Feast, Abhorrent Overlord, Demonlord Belzenlok, Demon of Catastrophes, Defiler of Souls, Grinning Demon – and, y’know, Griselbrand – are good enough to be in decks anyway. And even if you don’t trigger the auto-win text, it’s a powerful black-flavored card-drawing spell. There’s really no reason not to use this in black-heavy control decks, especially those without blue – slower Abzan- and Jund-colored decks will be eager to try it out. Liliana does like her demons and her demonic pacts, doesn’t she. While Demonic Pact in Origins was a depiction of her proclivity towards making deals she maybe didn’t read the fine print on (such as her contract defaulting to a slightly malfeasant elder dragon), this contract is slightly less convoluted. Slightly! The overall point of Liliana’s Contract in a lot of decks is that it’s a five mana, draw four spell (at the cost of four life, but who cares), which is about what black would expect out of card draw in terms of rate. That alone makes it worth playing. It has other text, and we’ll get to that, but if you’re using this, you’re wanting to use it for the massive spurt of card advantage. Now the other text: if you have four or more Demons with different names, you win at the start of your upkeep. That’s certainly flavorful and cute, if not a bit impractical. Right now, Standard has 10 Demon creatures (and a nameless Demon token from Dominaria‘s Rite of Belzenlok). Two of them cost three mana, two cost four mana, and the rest are five mana and higher. It might be plausible to put together a Demon-based win in Standard, and the creatures would be functional for winning the game through damage, but that line of text is more Plan B than an actual gameplan to win the game. 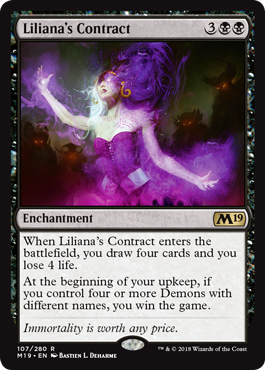 At the end of the day, Liliana’s Contract is a powerful black draw spell with a cute bit of text that may win you a game once in a blue moon. Play it as the former.